I have included only a few items concerning the history of this empire. A good source for more details can be found on Wikipedia or in history books. According to tradition, Egyptus (daughter of Ham and Zeptah) founded the first city in Egypt at Gebtu (aka Coptus). Her son was called Pharaoh and ruled as the first king. Thereafter, every ruler used the honorific title of Pharaoh. Two kingdoms later evolved along the Nile River. The Upper Kingdom's first capital was at Nekhen (aka Hierakonpolis "City of the Hawks"). The Lower Kingdom's capital was at Memphis. An example of a pre-dynastic temple was located at Hierakonpolis. Circa 3150 BC, Menes (aka Narmer) was the first pharaoh of Egypt's 1st Dynasty, who united Lower and Upper Egypt. Pharaoh wore the double crown with symbols of the two kingdoms: papyrus reed for Lower Egypt; lotus flower for Upper Egypt. Egyptians also accepted the concept of a divine god-king. The elite adopted the mastaba ("eternal house") for entombing pharaoh and other notables. The kingdom flourished under a centralized government, growth of cereal crops and improved commerce. 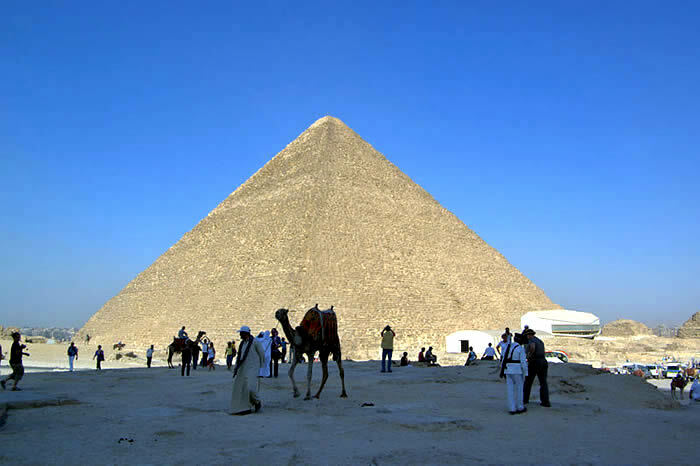 During the 3rd to 6th Dynasties, various pharaohs commissioned construction of massive pyramids. Many served as tombs, although the one for Khufu (aka Cheops; ruled 2589-2566 BC) at Giza actually was not a tomb. Among such pyramids were: Djoser (3rd Dynasty; 2670 BC) "Step Pyramid" at Saqqara; Sneferu (4th Dynasty; 2600 BC) "Bent Pyramid" and "Red Pyramid" at Dahshur [Sneferu also built the Meidum Pyramid]; Khafre (4th Dynasty; 2570 BC) at Giza. Khafre also built the Sphinx. The most famous architect was a commoner named Imhotep, who served Djoser. Pharaoh Djoser moved the capital from Abydos to Memphis. Administrative divisions were called "Sepats" but currently are called by the Greek term, Nome. The worship of Re (Rah) became more pronounced during the 5th Dynasty. Egyptians also built more trade ships and expanded overland trade routes. The Old Kingdom collapsed during the 6th Dynasty as civil war and a severe drought that prevented normal flooding of the Nile River. This period encompassed the 7th to part of the 11th Dynasties. Very little was known about the 7th and 8th since records and monuments were destroyed. Kings from Henen-Nesut ("House of the Royal Child"; aka Heracleopolis and modern Beni Suef) in Lower Egypt seized control for about 94 years. Founder of the 9th Dynasty was Wakhare Khefy I, a violent and evil man who caused much harm to the Egyptian populace. A Nile Crocodile reportedly ate him. Intef I, Nomarch (ruler of a Nome) of Thebes, overthrew the "Heracleopolis" kings and consolidated rule over Upper and Lower Egypt, thus ushering in the Middle Kingdom. In ancient Egyptian, Thebes was called Waset. In 2055 BC, Mentuhotep II completed the unification of Egypt. He also expanded south to the Second Cataract in Nubia. Subsequent pharaohs continued consolidating and expanding territory. High-water of the Middle Kingdom was under the warrior-Pharaoh Sensate III, who often led in battle. After a conquest, he built forts such as one in Nubia at Samna. One campaign was against Shechem in Palestine. He further curbed power of the Nomarchs, consolidating pharaoh's supreme position. Amenemhat III, Senusret's son, built the Mer-Wer (Great Canal; aka Bahr Yussef) that linked the Nile River to the Faiyum. The 12th Dynasty ended with the death of Sobekneferu, first recorded female ruler of Egypt. Circa 1800 BC, Hyksos forces first appeared in Egypt and eventually conquered the Lower Kingdom during Egypt's 13th Dynasty. They formed the 14th and 15th Dynasties, with a capital at Avaris. While Memphis fell to the Hyksos, Thebes declared independence as the 17th Dynasty under Sekhemrewahkhaw Rahotep. He and subsequent Theban rulers maintained peaceful relations with the Hyksos until Seqenenre Tao and Khamose launched wars to liberate the Lower Kingdom. This period covered the 18th - 20th Dynasties. Circa 1550 BC, Ahmose I succeeded in driving out the Hyksos. He reunified Upper and Lower Egypt and started the 18th Dynasty. 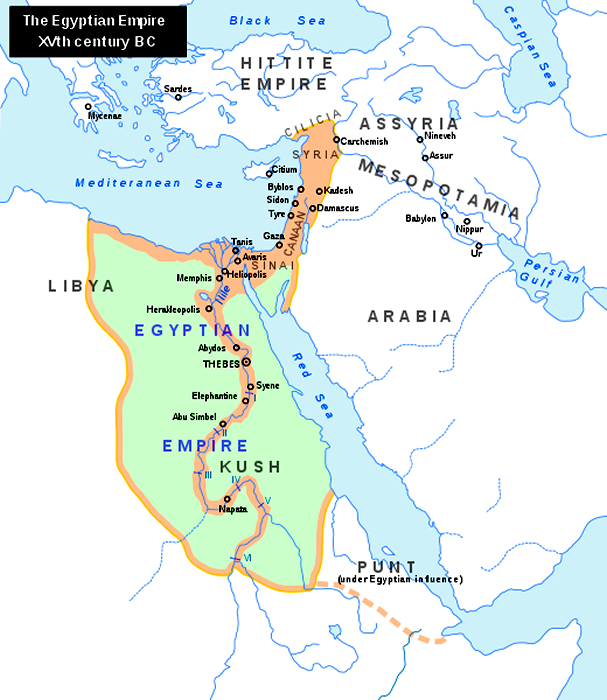 Egypt expanded to its height with conquests in Nubia, Palestine and fought wars with the Hittites. In the 17th century BC, Egypt staged a war against the Kingdom of Kush in modern Sudan. Pharaoh Hatshepsut built a Red Sea fleet to trade with Punt in modern Ethiopia. Pharaoh Thutmose III (18th Dynasty reign 1479-1425 BC), noted as the Napoléon of ancient Egypt, greatly expanded the army and brought Egypt to its greatest power and wealth. Another famous 18th Dynasty pharaoh was Akhenaten, who only worshipped Aten and constructed a new capital at Akhetaten. His disinterest in foreign affairs resulted in a weakened Egypt, as Hittites expanded their influence in both Canaan and Phoenicia. Akhenaten's wife was Nefertiti. In 1909 AD, G.E. 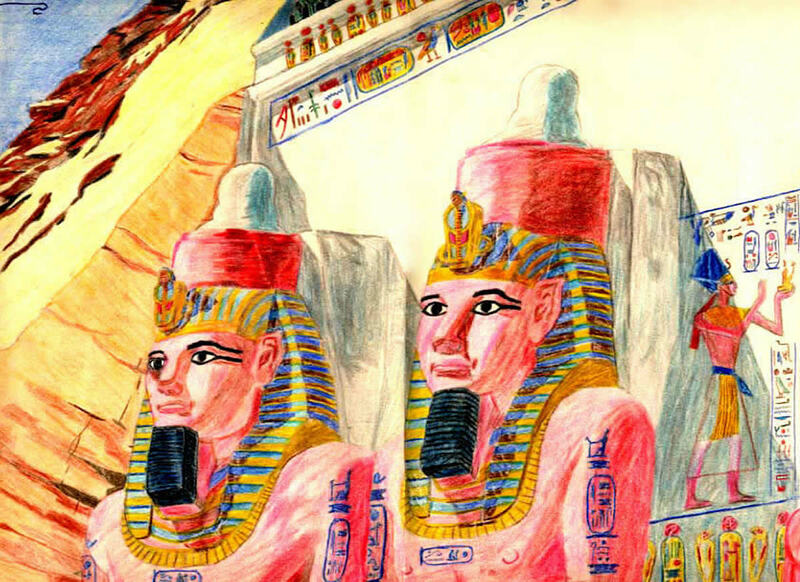 Kincaid led a Smithsonian expedition that discovered caves in the Grand Canyon, which contained artifacts from Akhanaten and Hyksos pharaoh Khyan. The tomb of Nebamun, a mid-ranking official circa 1350 BC, provided detailed visual images of life in ancient Egypt. These included a celebration, family, hunting, counting animal possessions and surveying fields. During the 19th Dynasty, Pharaoh Ramesses II attempted to regain territory in the Levant. He successfully defeated an invasion of sea pirates, called the Sherden. Ramesses later led forces against the Hittites in battle at Kadesh in 1274 BC. Egyptian forces successfully extended territory in the Levant, including Ramesses capturing a Hittite fort at Dapur. Ramesses also campaigned against the Nubians and in Libya. Circa 1471 BC, Ramesses triumphed in two battles over invading Sea Peoples. The many wars and construction projects depleted Egypt's treasury. The world's first recorded labor strike also occurred. Ramesses was buried in an elaborate tomb at Abu Simbel. In 1070 BC the New Kingdom and 20th Dynasty ended with the death of Ramesses XI. Circa 945 BC, Sheshonq I, leader of the Libu (aka Meshwesh), invaded Egypt and usurped the throne. Over 100 years later the empire fragmented into Lower and Upper Egypt. Kashta from the Kingdom of Kush exerted influence over the weak Theban pharaoh, Shepenupet. In 727 BC, Piye from Kush successfully conquered and unified Egypt. He also founded the 25th Dynasty. Assyrian ruler, Shalmaneser III, foiled Piye's attempt to expand into the Near East. Circa 700-600 BC, Kush adopted the Meroitic script. Assyrian forces invaded Egypt in 670 BC and sacked both Memphis and Thebes in 664 BC. Client kings subsequently ruled in Egypt. The 26th Dynasty (672-525 BC) reinstated Egyptian rule. The government started construction on a canal between the Nile River and Red Sea. Many Jews fled to Egypt after Babylonian forces destroyed the temple of Solomon in 586 BC. Some refugees settled at Elephantine Island. Other empires conquered Egypt in succession, including: Persia; Alexander; Ptolomy (who built the temple of Horus at Edfu); Rome; Byzantine; Sassanid.